When running a PHP project locally, it is required to have PHP installed. In order to enable the debugging features, the Xdebug PHP extension has to be properly enabled. 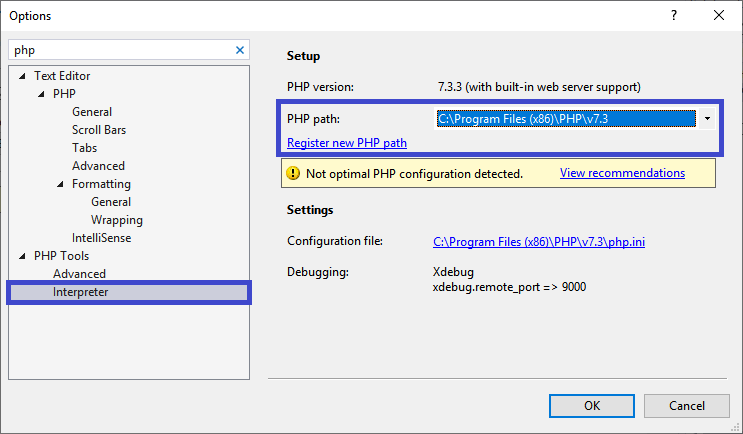 In case the user does not have PHP with Xdebug installed or configured properly, PHP Tools offer quick installation from Microsoft Web Platform Installer. Every time a user starts a project (by default F5 or Ctrl+F5), PHP Tools automatically checks the configuration. In case of an issue, a quick configuration dialog box will appear (see below). 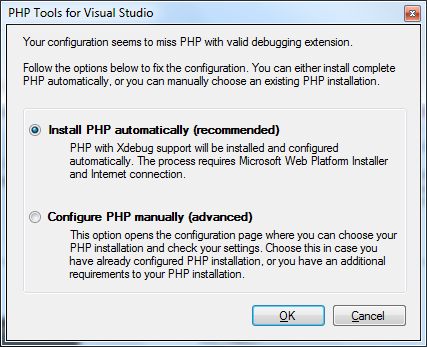 The first option lets the user install the latest PHP version from Web Platform Installer with Xdebug support automatically configured. The user may be asked for elevated rights. The process may require to install or update Web Platform Installer first. During the installation process, a command line may appear. Note that the process may take several minutes, depending on the user's network connection. Remarks: Automatic PHP installation is not available on Windows XP platform. User may be asked for elevated rights. In case of insufficient permissions, the process may fail. The process requires access to C:\Program Files\IIS Express\PHP\ folder and its content. In case the user has configured PHP already, just open Tools | Options | PHP Tools | Interpreter to review and access its settings and issues. The user should check whether the correct PHP installation is used, and whether the corresponding configuration file (php.ini) is correct. 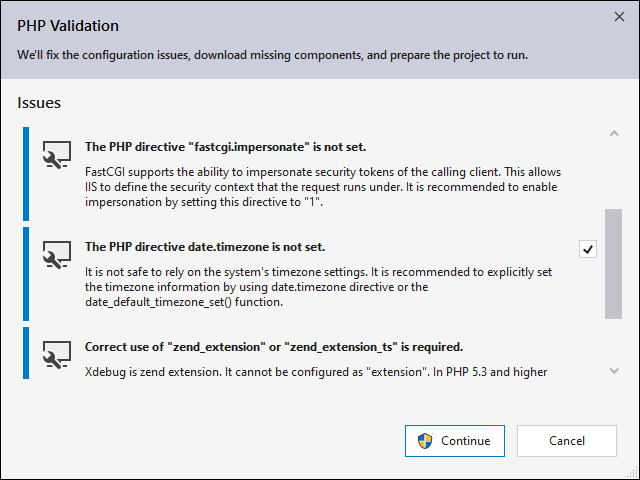 The PHP path option tells Visual Studio what PHP will be used as a default interpreter & runtime. 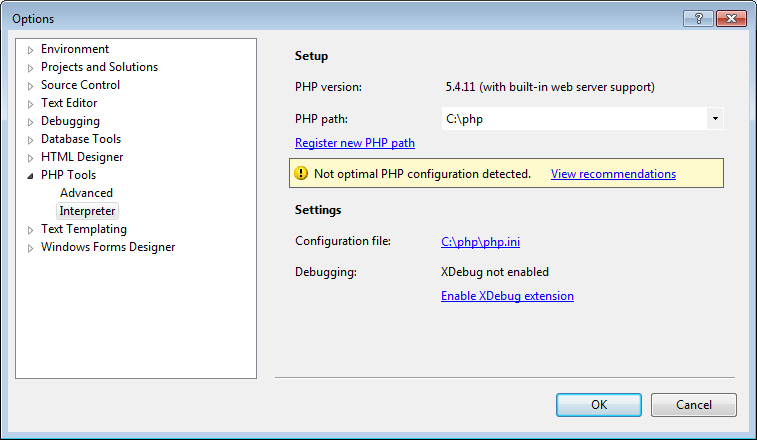 A dialog box allows user to quickly access php.ini file and check & fix possible issues. In case of a configuration issue, the user is notified with a yellow bar and a View recommendations button. The system environment variable PHPRC forces PHP to use php.ini in specified location. Removing this environment variable is recommended. PHP looks for php.ini in its directory. Ensure the php.ini file exists. PHP specifies several other locations, such as system registry. Follow http://php.net/manual/en/configuration.file.php for more information.